The Coroner’s Inquest Verdict regarding the Death of G. A. Barclay! 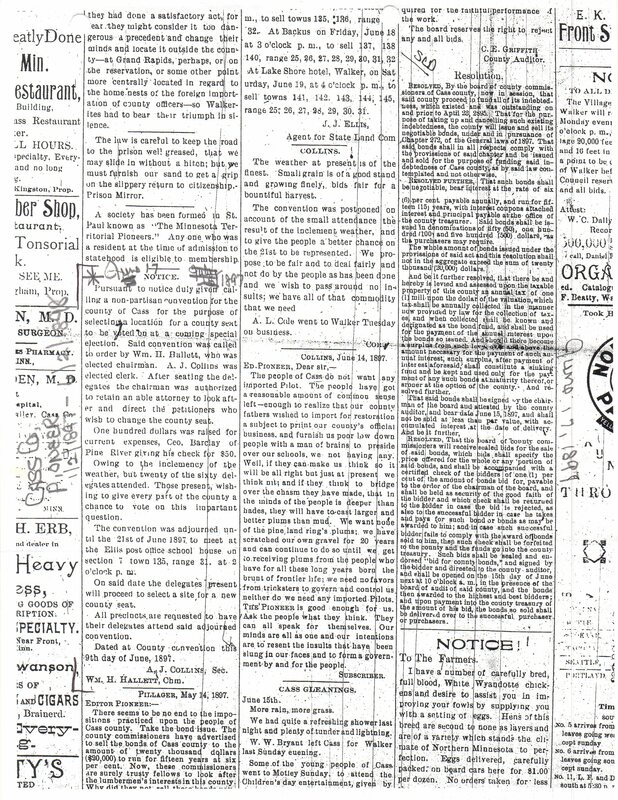 The Coroner’s Inquest regarding the murder of George A. Barclay took two days. On the second day a verdict was issued and it was recorded in the Register of the Coroner, Cass County, Minnesota. It appeared in the newspaper the next day. Source: The Register of Coroner’s Inquests, County of Cass, State of Minnesota, in the Matter of the Inquest held upon the body of George A. Barclay, by E.R. Sundberg, acting Coroner of said County. Nov. 2, 1899: Oct 31, the following jury was impaneled J.B. Spencer, B. O’Connor, Peter Dennis, John A. Wilson. Jury sworn and examination opened. Verdict of Jury: That the said George A. Barclay came to his death on Oct 29, 1898 between 7 & 8 P.M. O’clock while sitting in his Hotel office by a bullet passing through his neck from a gun or revolver in the hands of some person on the outside of the building and to this jury unknown. In testimony whereof the said coroner and jurors of this inquest have hereunto set their hands the 2nd day of Nov. 1898. John King, Foreman, R.D. Holden, P. Dennis, John A Wilson, J.B. Spencer, B. O’Connor. E.R. Sundberg, Justice of the Peace, & Acting Coroner. The next week issue for November 10th was missing on the film at the Minnesota Historical Society. There is no official death certificate for George A. Barclay at the Cass County Courthouse per my personal investigation. After George’s death, Amarilla tried for his Civil War pension on several occasions and below is an affidavit that described the death of George A. Barclay several years later. Bertha Michelson on February 25, 1901 made this statement, she knew George about 4 years. It is interesting to me that she was not among the witnesses at the Coroner’s Inquest? It could be assumed that this would be the end of the investigation of George A. Barclay’s death, but it was not. A Grand Jury would be called in May of 1899 and then in May of 1900 there would be a trial. There was more events to come in this sad tale. George is involved in another round of politics in 1897 regarding the organization of Cass County. Of course George A. Barclay wanted Pine River to be the county seat. He was too late in organizing the convention to vote on that subject. This notice for a convention to choose a county seat for Cass appeared in the Cass County Pioneer newspaper in July of 1897 somewhat hidden in back pages. Notice: Pursuant to notice duly given calling a non-partisan convention for the county of Cass for the purpose of selecting a location for a county seat to be voted on at a coming special election. Said convention was called to order by Wm. H. Hallett, who was elected chairman. A. J. Collins was elected clerk. After seating the delegates the chairman was authorized to retain an able attorney to look after an direct the petitioners who wish to change the county seat. One hundred dollars was raised for current expenses, Geo. Barclay of Pine River giving his check for $50. Owing to the inclemency of the weather, but twenty of the sixty delegates attended. Those present, wishing to give every part of the county a chance to vote on this important question. The convention was adjourned until the 21st of June 1897 to meet at the Ellis post office school house on section 7 town 135, range 31, at 2 o’clock p.m. On said date the delegates present will proceed to select a site for a new county seat. All precincts are requested to have their delegates attend said adjourned convention. Dated at County convention this the day of June, 1897 A Collins, Sec. Wm. H. Hallet, Chm. Source: Notice, Cass County Pioneer Newspaper, Walker, MN, Film June 17, 1897, #1/2/1897 to 6/2/1898, Thursday, July 15, 1897 edition, Minnesota Historical Society newspaper collection. “The governor appointments as Cass County Commissioners those who “will organize the county and decide the county seat” consisted of men all friendly to the timber interests. It soon became obvious to George Barclay and others that “timber forces” were in control of the politics of the county, at least temporarily, for on May 14, 1897, the boom town of Walker which had been in existence for only a little over a year was “named” by the new commissioners the county seat of Cass County. Barclay, together with W.H. Hallett immediately called a “non-partisan convention” at the Collins House precinct south of Barclay’s Ranch for the purpose of “selecting a location for the county’s seat.” Barclay had high hopes that the “convention” would select his settlement in place of Walker, and, therefore, he readily contributed $50 to defray part of the $100 convention expense. Apparently, he hoped that in an election resulting from the conflict over two alternative county seats that the more populated southern portions of the county would outvote the northern region. Barclay was to be disappointed for the hastily called convention could not agree on any single policy and broke up without taking positive stand on an alternative county seat.” From the Brainerd Dispatch June 18, 1897, pg. 4, Logsleds bibliography notes pg, 516. According to the Cass County Historical Society the reason Walker was named the county seat was because it was incorporated in 1896 having 100 male voters. Pine River had not yet incorporated and that would not happen till 1901. UPDATE July 11, 2013: Apparently I have written this post 2 times. I apologize for that confusion. I wrote about the County Seat of Cass on March 21, 2013. So I am adding the last part of that post to this one and then deleting the March post. Once Walker was chosen as the county seat of Cass County, Minnesota the next step was to incorporate Pine River. It took a few years for that to happen. Pine River Gossip in 1897! The organization of Cass County and the establishment of Walker as the county seat was taking place but at the same time George Barclay was also involved with business, local events, and family happenings. I return to the gossip columns in the newspaper and learn that Grace and Amarilla were both mentioned as well. January 2, 1897: “Mr. Barclay made a flying trip to Brainerd and returned with his wife and daughter. The later came up to spend vacation.” Grace was sixteen years old at this time. January 2, 1897 George is on the move. Source: Local News-Pine River, July 1, 1897, Thurs, Cass County Pioneer Newspaper. 1/1/1897-6/2/1898. 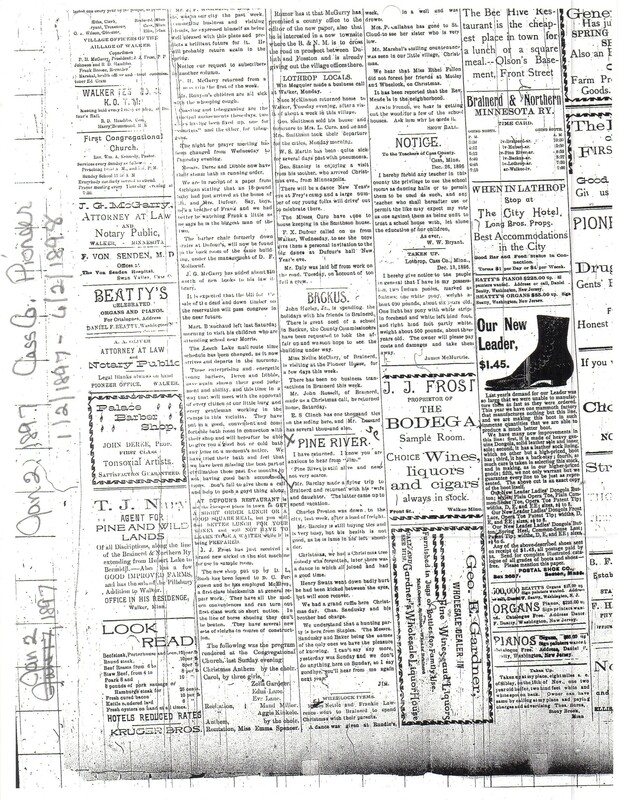 Source: Cass County Pioneer, Jan. 2, 1897 to Jan 2, 1898 – July 15, 1897 Front page, 3rd column at the top. Note: I do not know what lawsuit the gossip column was referring to? I am a bit curious but have not had time to research it. It would require looking at court documents and that could get tricky depending on which court it was in, state, federal or county? The fact that my grandmother Grace was involved is very intriguing. If I was to speculate it might have had something to do with the railroad or his past partner?